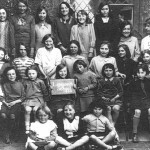 The links below take you to two photographs of the pupils of Longworth School in 1930. We have tentatively been able to put names to most of the pupils in the photographs, although some of you may be able to correct mistakes. Move your mouse over each face to see the name. These young bright faces stare back at us across seventy years of history. Wouldn’t it be interesting to build up a little profile of each person, so that we knew something about the lives of each of these schoolchildren? Who left the village to live elsewhere? Who married a village sweetheart or perhaps even a class-mate who is also in the matching picture? Who still lives in the village today? Who has a relative in the village today who could tell us something about the girl or boy in the photograph? What did the pupil go on to do for a living? What is the most exciting thing that these pupils think happened to them in their lives? What are the stories that these young faces could now tell us? Well, it would be fun to have a paragraph to match each of the faces. 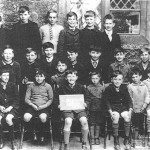 In fact it could be much more than that because it would tell us something about village life of those who were at school in the early 1930s. Local historical research is often built on similar approaches. A group of people with something in common, a cohort, are followed through and their experiences recorded. Well, what we would like to do may not amount to anything quite as grand as that, but we would like to collect some information and store the data for the use of future historians or simply for people who are interested in the recent past in our local villages. More interestingly for us perhaps, is that (with permission) we could add some more detail about each of these individuals on this website. If you are either in one of these pictures or know someone who is, perhaps a older relative, then you might like to contribute something, however small, that will illuminate these faces with some interesting written detail. All you need to do is to contact webmaster@longworthvillage.org.uk.